Advancements in the field of nanotechnology and soaring need for metal nanoparticles across various end-use industries are likely to significantly rub off on demand for gold nanoparticles. Adoption of gold nanoparticles has been witnessing a considerable rise for nano-technology based diagnostics and therapeutics in the medical field. They seek extensive adoption for applications including treatment of tumor and cancer, along with targeted diagnosis in patients. The nanoparticles industry has been witnessing an influx of research & development activities apropos to potential applications of the gold nanoparticles. For example, several researches have implied potential of gold nanoparticles to enhance biosynthesis in plant plastids through injection into plant cells. The process further enables assessment of these particles’ performance in plant cells. Considered as the potential osteogenic agents, gold nanoparticles have huge influence on the osteoblast differentiation simulation in the space of dentistry. Additionally, titanium dental implant surfaces have witness immense traction over the recent past, wherein gold nanoparticles seek notable adoption. According to Transparency Market Research’s recently compiled report, the global gold nanoparticles market will exhibit a CAGR of over 15% during the forecast period, 2017 to 2026. More than US$ 8,000 Mn worth of gold nanoparticles are envisaged to be sold worldwide by 2026-end. They are extensively utilized as contrast agents for optical coherence tomography (OCT) technique in the dentistry. Development and production of gold nanoparticles in dentinal tubules & layers for assisting visualization of structures in a non-invasive and non-destructive manner has been emerging as a new trend in the global gold nanoparticles market. The ultra-light weight of gold nanoparticles has proliferated their application in glass and optics. Lightweight property of these nanoparticles helps in enhancing their surface area, thereby offering features associated with bulk substances but confined to a compact space, and delivering same functionality as that of their bulk counterparts. Global inclination towards compact electronic devices has further impacted demand for ultra-thin nanoparticles such as gold nanoparticles. Nanowires and inks produced by using these nanoparticles seek application in the assembly of electronic biosensors and compact storage devices. Asia-Pacific excluding Japan (APEJ) will steer the global market for gold nanoparticles, with an estimated market revenue share of over 30% by 2026-end. The region is largest electronics manufacturing hub that is governed by development of the nanotechnology industry across countries such as India, Korea, Taiwan, and China. Expansion of the photovoltaic and high-precision printing industries will further underpin demand for gold nanoparticles in APEJ. Adoption of nanotechnology in the healthcare sector for pharmaceutical and medical applications has surged significantly in the past couple of years. Diagnostics, medical imaging, and therapeutics have remained dominant domains of healthcare with regard to nanotechnology adoption. Additionally, robust research & development activities associated with cancer therapeutics & prevention targeted toward integration of nanoparticle technology with drug delivery systems is expected to pose a positive impact on the market’s growth in the near future. These instances will further rub off on demand for gold nanoparticles in the healthcare sector. Healthcare will prevail as the largest end-user of gold nanoparticles, in terms of revenues. Characterized by intense competitive environment, the global market for gold nanoparticles is marked by occupancy of several multinational as well as medium-scale enterprises. Deemed as a highly cost-exhaustive industry, gold nanoparticles have modest yield for specific range of applications. Enormous research and development investments regarding application-specific gold nanoparticles is a key characteristic of the market. The report profiles key participants supporting growth of the global gold nanoparticles market, which include BBI Solutions, Johnson Matthey Plc, Meliorum Technologies, Inc., Innova Biosciences, and Cytodiagnostics. With increasing demand and constant innovation in the development of compact, smarter and versatile devices, the global electronics industry is likely to reflect a considerable growth in the upcoming years. Nanotechnology seeks extensive adoption in various electronic products, which in turn entails demand for different types of nanoparticles such as gold nanoparticles. Additionally, positive outlook estimated toward growing applications of nanotechnology in the areas of dentistry and medical such as nano medicines, drug delivery systems, and therapeutics will further create immense demand for gold nanoparticles. However, stringent regulations imposed on nano-materials’ specification and utilization, coupled with fluctuating costs of gold are likely to prevail as key growth deterrents for the global gold nanoparticles market. In its recently published research report, Transparency Market Research delivers valuable insights on the nature of the global gold nanoparticles market’s growth in the period of forecast (2017-2026). 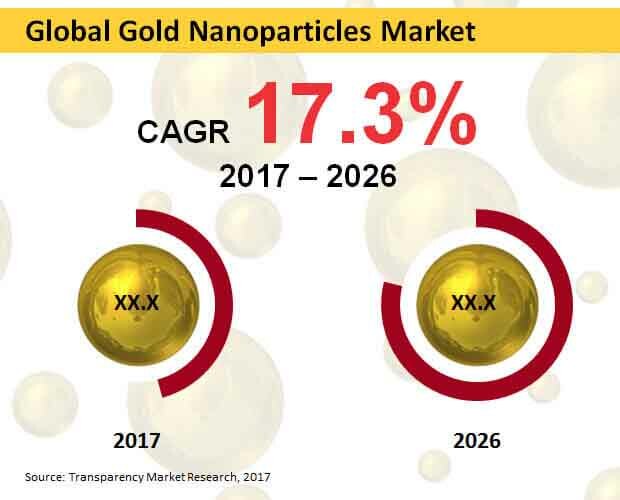 An extensive market research has been delivered by the report on gold nanoparticles, along with in-depth insights and forecasts on the market. Key research findings from the report aim at bolstering undertakings of the market players, and expanding the gold nanoparticles production bases over geographies. A large number of data regarding production and sales of gold nanoparticles is available across multiple databases and sources. This data has been authentically procured, and the multidisciplinary research approach employed has helped in creating value from the data. Inclining customer preferences, analysis on pricing & cost structure, complexities in supply chain, and regional footprint of the market players are key parameters considered by the analysts while analyzing the procured data. The forecast market size evaluations rendered in the report effectively reflect on new manufacturing prospects, sales impediments, adoption challenges, and industry trends. From the overall company shares and market size to the value share of every segment & its sub-segments in the market, an exhaustive analysis has been offered that elucidates future evolution of the companies and segments in the market. A multidimensional validation of the data has been done by our analysts, with the findings offered in the report matched to intelligence acquired from key opinion makers, industry experts, and trade analysts. This has further helped in extending accuracy of the forecast market size estimations. Some weighted chapters in the report elucidate key presumptive scenarios that reflect the way the global gold nanoparticles market’s evolution under specific conditions. Regulatory opinions of different companies on sales of gold nanoparticles has also been unveiled in the report. Intelligence and data offered in the report are substantiated though continuous discussions with key stakeholders and the market players while developing this insightful report. Various segments and sub-segments of the global gold nanoparticles market, which have been analyzed by the report have been illustrated in the taxonomy table below. In the concluding chapter of the report, prominent companies associated with gold nano particles manufacturing have been profiled and examined. Assessment of the key players partaking in the global gold nanoparticles market sheds light on novel strategies leveraged by the industry leaders as well as niche market players. A comparative analysis carried out on the market players has helped in the generation of key insights on the evolution of production techniques in the upcoming years. Detailed and actionable insights issued in the report aim at enhancing the understanding of gold nanoparticles manufacturing industries. This chapter also offers intelligence on untapped market opportunities coupled with new sales avenues.